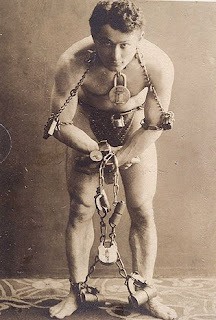 I remember getting a childrens/youth book about Houdini's life for my birthday, when I was ten years old. The book was written by a Swedish childrens books author who had prior written books about Sweden's Most Haunted Castles etc. I have always been fascinated, from a very early age, by spirits, ghosts and UFO:s, and the spirituality och conspiracy interest came later on. And I clearly remember in that book that Houdini came back to his wife as a spirit and gave her "the sign". Funny that this was written in a children's book in the mid 90's. Thanks for the information, Nicky. This is exactly what Ian Crane was talking about! These days some of the most unusual, but also the most intriguing and explosive, information come from old books or unusual sources like childrens books.